Pelikan Edelstein Aventurine | Inkdependence! I got this ink from a friend at the Triangle Pen Club a while back, and I never really got around to trying it out until recently. It's a perfect time of year to review a green ink, and this one is very St.-Patrick-y. Spring-y. Anyway, it's a very happy green, and I quite enjoy seeing it on the page. I say it's medium wet because it flows so well in the very fine nib of that Kakuno, but it doesn't go nuts in the very wet broad nib of my L-Tech. Good stuff. Obviously, the fine nib was used in the top bit and the broad in the bottom bit. Is that a cat hair in my shot? Yep. Totally. Maybe a whisker, actually. Not the best performance, but most of the bleed is from the wet, broad nib. It's to be expected, honestly. The fine nib sample isn't bad, though there are a couple of spots where you've got some bleed. Not great, but not bad either. 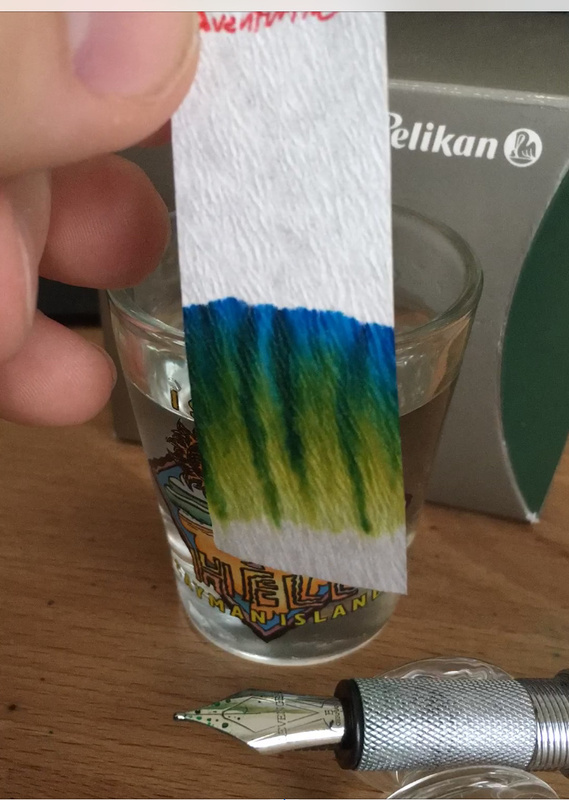 This chromatography is so cool I had to give you two pictures. The one below is from the very end of the video clip. Fresh. I like this springy jewel-tone, but it's not quite as well-behaved as I'd like it to be for a wide nib. It's pretty good in a fine nib, though, and a true green. Like other Edelstein inks, this one comes in an awesome 50ml bottle and costs about $24.